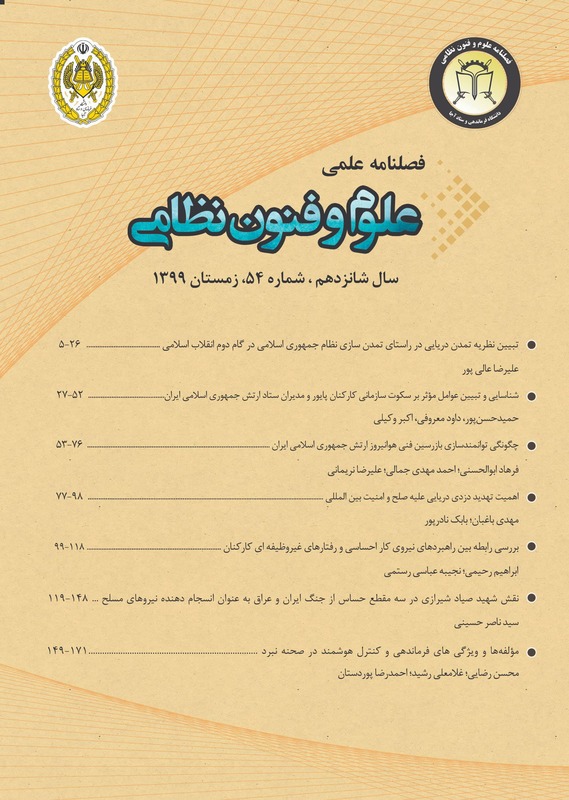 حسن پور, حمید, جمالی, احمدمهدی, بختیاری, یوسف. (1397). هوانیروز و دفع تجاوز دشمن بعثی در سال دوم جنگ. علوم و فنون نظامی, 14(44), 55-76. حمید حسن پور; احمدمهدی جمالی; یوسف بختیاری. "هوانیروز و دفع تجاوز دشمن بعثی در سال دوم جنگ". علوم و فنون نظامی, 14, 44, 1397, 55-76. حسن پور, حمید, جمالی, احمدمهدی, بختیاری, یوسف. (1397). 'هوانیروز و دفع تجاوز دشمن بعثی در سال دوم جنگ', علوم و فنون نظامی, 14(44), pp. 55-76. حسن پور, حمید, جمالی, احمدمهدی, بختیاری, یوسف. هوانیروز و دفع تجاوز دشمن بعثی در سال دوم جنگ. علوم و فنون نظامی, 1397; 14(44): 55-76. هوانیروز ارتش جمهوری اسلامی ایران با توجه به مقدورات خود در پشتیبانی آتش، هلی­برن، شناسایی و تخلیه مجروحین از شروع تا پایان جنگ درعملیات­های آفندی و پدافندی حضور که در این میان با توجه به راهبرد نظامی جمهوری اسلامی ایران در بیرون راندن دشمن و دفع تجاوز دشمن بعثی در سال دوم جنگ تحمیلی، نقش مؤثرتری داشته است. بنابراین ضروری است تا تجارب و عملکرد این یگان و کارکنان آن در زمینه ابعاد پیش گفته، بررسی و نقش آن در پیروزی و دفع تجاوز دشمن تبیین گردد. هدف کلی این مقاله تبیین عملکرد هوانیروز در ابعاد پشتیبانی آتش، هلی­برن نیروها، شناسایی هوایی و تخلیه مجروحین در سال دوم جنگ در دفع متجاوز می­باشد. جامعه این تحقیق از میان خلبانان و فرماندهان هوانیروز و طراحان و فرماندهان در رده لشگر، تیپ و جانشینان آنان بوده و روش تحقیق تاریخی- توصیفی با رویکرد آمیخته و داده­ها با روش میدانی و کتابخانه­ای و با ابزارهایی مانند اسناد و مدارک، مصاحبه و پرسشنامه گردآوری شده است. نتایج نشان داده که هوانیروز ارتش جمهوری اسلامی ایران در ابعاد پشتیبانی آتش از یگان­های آفندی و پدافندی در مناطق عملیات جنوب و در زمینه هلی‌برن نیروها و ترابری مهمات و تدارکات در مناطق عملیاتی غرب و شمال‌غرب و همچنین تخلیه مجروحین و شهدا در مناطق جنوب و شمال‌غرب و نیز در زمینه شناسایی هوایی در مناطق عملیاتی جنوب و شمال‌غرب کشور نقش و عملکرد مؤثری در پیروزی­های سال دوم جنگ تحمیلی داشته است. 3Iran, Tehran, War University, School of Command and Staff, Department of ground force Education. The Islamic Republic of Iran's Army aviation, according to its capabilities in supporting fire, heliborn, reconnaissance and evacuating the injured personnel was ready from the beginning to the end of the war in offensive and defensive operations, including the military strategy of the Islamic Republic of Iran to expel the enemy and repel the enemy's invasion ofenemy played a more effective role in the second year of the imposed war. Therefore, it is necessary to examine the experiences and performance of this unit and its staff in the context of the above dimensions, and its role in defeating and repelling the enemy's aggression. The general purpose of this paper is to explain the army aviation's performance in the areas of fire support, heliborn the forces, aerial reconnaissance and evacuation of the injured in the second year of the war. The results showed that the Iranian army aviation in the area of fire support of offensive and defensive units in the southern operations and in the area of the heliborn forces and transportation of ammunition and logistics in the operational areas of the west and northwest as well as the evacuation of injured and martyrs in the south and northwest and Also, in the field of aerial reconnaissance in operational areas of the south and northwest of the country, and played the effective role in the victories of the second year of the imposed war. Key words : "army aviation", "IRIA", "Disposal of Aggression", "Second Year of War"